This post was updated on October 15, 2015 to reflect new changes with Equalify. Equalify is no longer offered free, but rather has a PRO version that can be purchased with additional features. More info below. 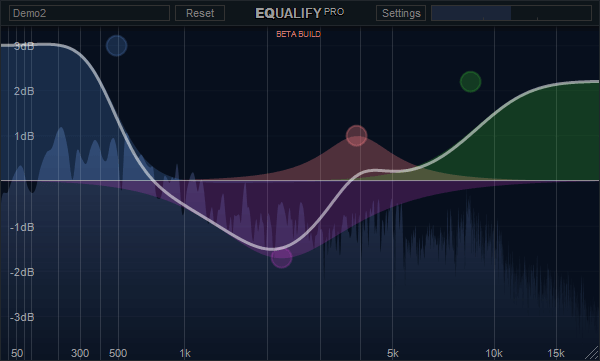 Have you ever wondered why Spotify hasn’t offered any sort of equalizer (EQ) to help make your music sound even better? You aren’t the only one. Luckily, there’s a super simple add-on out there called Equalify PRO. Unfortunately, it is only for Windows users. 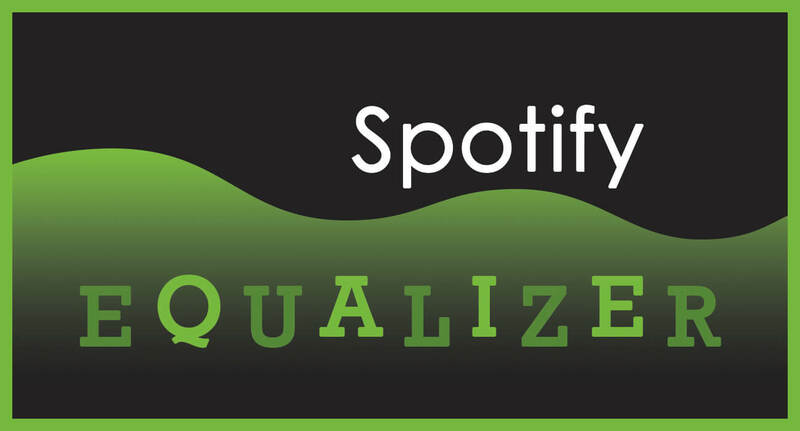 Follow the simple steps below and you’ll learn how to add an equalizer to Spotify using Equalify PRO in a matter of a couple minutes. Go to Equalify's main site and then click on the "Register" button in the upper-right corner or just go directly to their register page. Fill out all the necessary information and check the boxes if you have read the documentation and then hit the "Register" button. Once you have registered, you should receive an email to verify your account and activate it. Go to your email and click on the link, and your account will be verified. It should then bring you to the login page where you can login with the credentials that you just provided. After you are logged in, you have to decide which licensing plan you want to go with. The plans are all priced in British Pounds (£) - either £5, £10, or £15. The lowest tier gets you a license for one machine, and that's it. The middle tier gives you licenses for up to 15 machines, and the top tier gives you licenses for up to 200 machines, along with priority support, and free future upgrades. Once you have decided which plan to go with, hit "Buy Now" on the appropriate one. You should be redirected to PayPal where you can pay for your license(s). Like I said earlier, the prices are in British Pounds, so if you are in the United States, the appropriate conversion from British Pounds to U.S. Dollars (USD) will take place. After you complete your purchase, you should get brought to a page telling you that your payment is verified, and there will be a button to download Equalify Pro. Once your file is downloaded, click on it to launch the installer. The installer will come up. The most important part of installing Equalify Pro is to make sure that it is installed in the correct folder. You'll see in the picture above that it points you to where Equalify Pro should be installed. 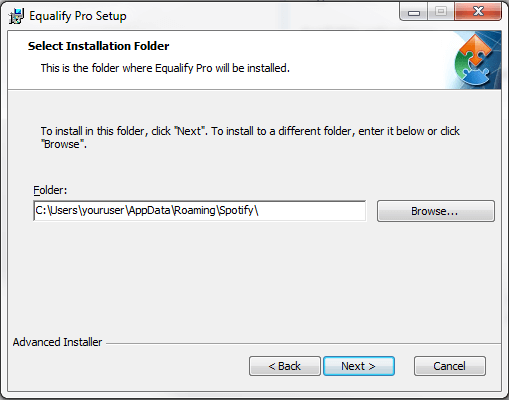 On the page where you choose your installation path, make sure that the folder matches similarly to the format they show you: x:\Users\YOUR_USER\AppData\Roaming\Spotify. Then, hit "Next" and then the "Install" button on the last page to finish it. Equalify Pro will then install which should only take a few seconds. 4. Hook Up & Enjoy! Now you're ready to enjoy using Equalify Pro! If you already had Spotify opened, make sure you close out of it and reopen it in order for Equalify Pro to show up. When launching Spotify or first playing a track, you may be asked to enter your Equalify Pro username and password (the same you used on the website). After entering your credentials, the machine will be activated automatically. Now, when you go and listen to any song, you should see a green "equalizer" icon in the top left corner next to the Spotify icon. You can click on this and it will open Equalify Pro. Go ahead, make a new preset and set it to your liking! For example, if you're all about that bass, 'bout that bass (no treble), boost up the bass on the left side of the of your preset as shown below. My favorite is a "Rock" type preset where the bass and treble are both boosted up, and the mid-range is "scooped" down in the middle (somewhat similar to the image shown). Simple as that! You now have a Spotify equalizer that you can use to your liking. Equalize away!